When we interviewed Ariel Mitchell this last December, she let us know that she was thinking about moving abroad, and now those plans have been confirmed. "In July, my husband and I will be moving to Norway," the artist stated. Luckily for us San Diegans, though, we've at least had the opportunity to get to know Mitchell and her novel contributions to art. Also, in the last couple of months, she has completed a handful of new pieces that assure us that, no matter the location, Mitchell will continue to share her thoughts and visions in ways that energize her audience with their unique insights. We focus on four of those new pieces below, with added comments by Mitchell. 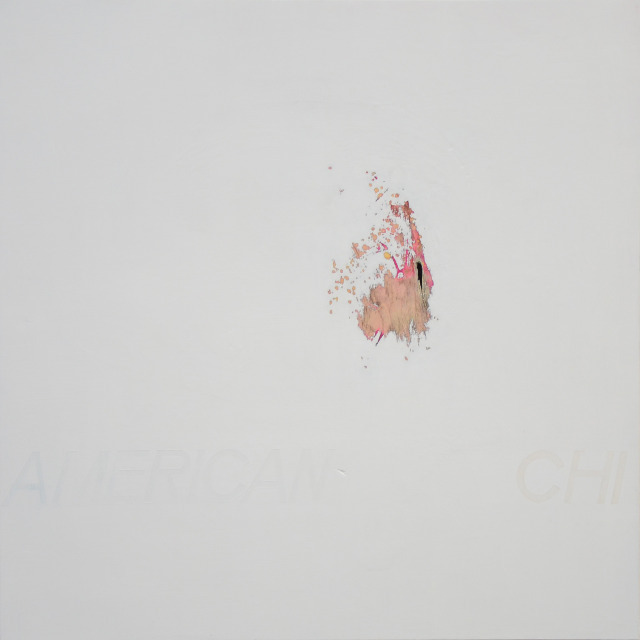 This piece, American Chi seems joyful at first glance. A sense of freedom exudes from the largely blank panel. So fresh, so clean. The lighter-red, rosy marks, mixing in with the cream color, seem to form a disintegrating hand, or a collection of scattered islands, separate but still close enough and alike enough to be unified. The tiny black spot combined with the title makes us think that this might be a comment on the imperfection of America's chi, and possibly its isolation from other chis. 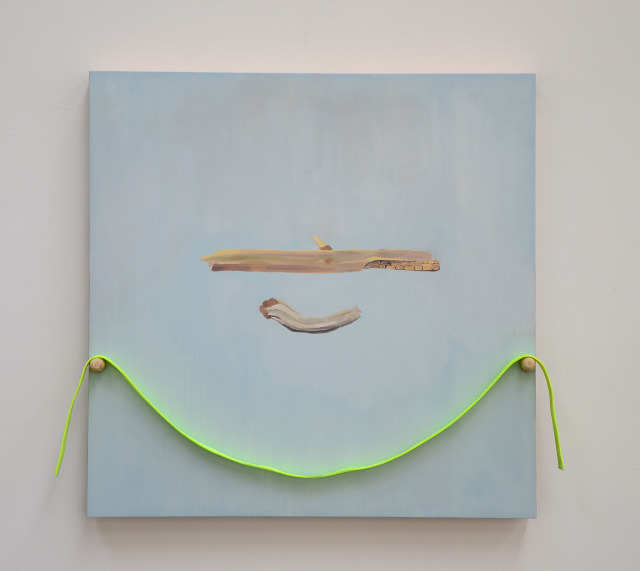 Ariel Mitchell: Haha, so, although it may seem joyful, it is a painting that lost a little in the photo. It actually says AMERICAN CHI [in the bottom right corner], but "american" is white on white and "chi" is an iridescent on white. The black you see in it is actually a hole in the wood panel. That panel was a much older piece I was never happy with, so I found it a chance to start fresh. The hole was in the older piece, and was actually the only part of it I liked. I decided on "american chi" as the text because I often wonder what that is. Chi, or prana, life force, breath, etc. in eastern religions is the energy in the body. I think this concept is something that is lost in the western world, as we tend to have to see stuff to believe it. That is why I made it almost invisible. 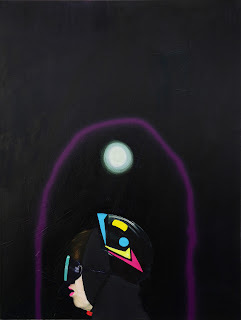 Mitchell certainly seems to like the bright neon colors, and she uses them to great effect, capturing our eyes and evoking feelings of metaphysical planes. 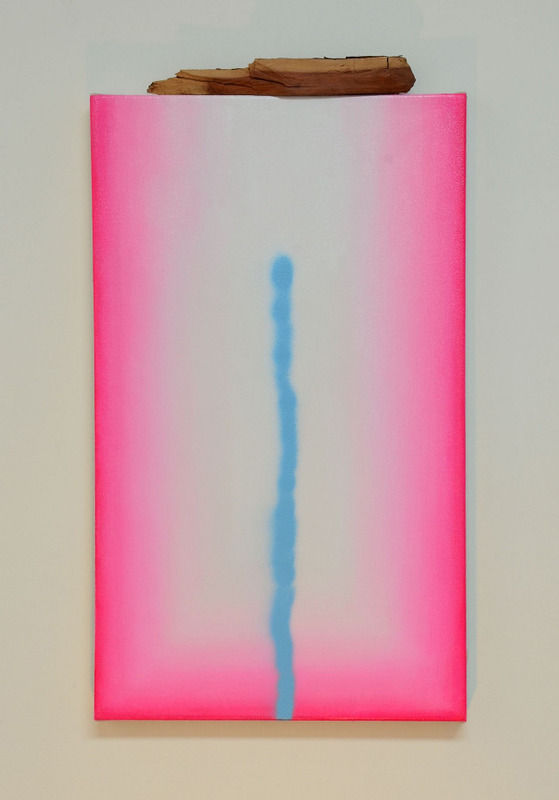 The blue line makes us think of travelling. Possibly this is a representation of the line of a heritage travelling through time. At the bottom of the canvas, the line runs right off the edge. Possibly, that represents how we don't know where heritages came from, or where they really start. Towards the top of the canvas, the line of heritage hasn't really reached its destination yet, which it may never do. All we know for sure is that we're here, and we started sometime ago. In short, it seems to represent a pretty moment of existential awareness. Okay, enough of our blathering. What's it to you, Ariel? Ariel Mitchell: It's true, I have always had an affinity with neon, ever since I was a child. I find it really interesting paired with metallic colors because of what they do to the light, and their instinctive opposition with it. Heritage is kind of a transition piece, but you are partially right in your reading. The stick on the top is from Big Sur (I have a stick collection from around the world) and I used it because of where it's from, and it's weight, visually and physically. Neon (seeming so man-made) and the natural world seem to be relatively opposing components, which is why I like to try and force them together. We love love love this one! 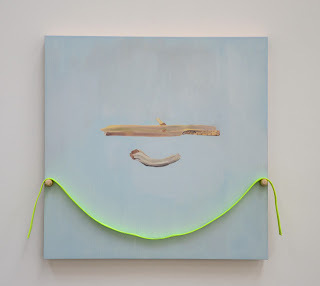 We love the soft, soothing colors of the painting, and we love the contrast of the bright green, and how it's not a tight band, but kind of almost amazingly staying there, suspended as it is. Maybe the webbing is there to catch the falling pieces of wood. Or maybe they're simply all floating in harmony. Ariel Mitchell: Thank you. I like this one too. The found wood does make up the pegs, and the sticks are painted. One stick is from Finland, the other from a tiny town in northern ca called Big Lagoon. This was done on another older piece that never finished. I actually used to put objects in paintings often, but I did it without consideration for the painting. This one was thought about. Webbing is used for lots of things, some being sports that put your life in danger, like sky-diving, tight-roping, sailing, etc. This webbing was from our sailboat, and we used it once when the waves were pretty big (clip-in with a life vest thing). This was another attempt at bringing forest together with neon, and the act of sailing. It is kind of a portrait of my husband and I, in a way. It also talks about my desire to want to put to opposing things together, like poles of a magnet. Classic! This one warms the heart, even as it communicates a deeply existential reality. Mitchell's own performances in her pieces add a sense of familiarity to them. The pieces can be painfully sad or potently stirring, but the fact that it's her, the artist performing in them, adds a sense of relief to them, as did Alfred Hitchcock's and Charlie Chaplin's performances in their respective movies. This piece combined with its title seems self-explanatory: a perfect illustration of the complexity involved in knowing a thing, or of having an idea. The piece evokes ideas of righteousness, isolation, and other stresses. Likely, this is one of the more recognizable fruits of Mitchell's yoga practice, which we discussed in our first article with her. Ariel Mitchell: Thank you for the compliments. This was originally a performance done at a residency in Finland, and it had to be more than just a photo. This painting is more or less where my work is going now; do a performance, and make paintings (or something) from the documentation. Well, thank you again, Ariel Mitchell, for sharing your art with us. Blessings to you and yours wherever your road may lead you! And congrats to Norway for snagging one of our shining stars!